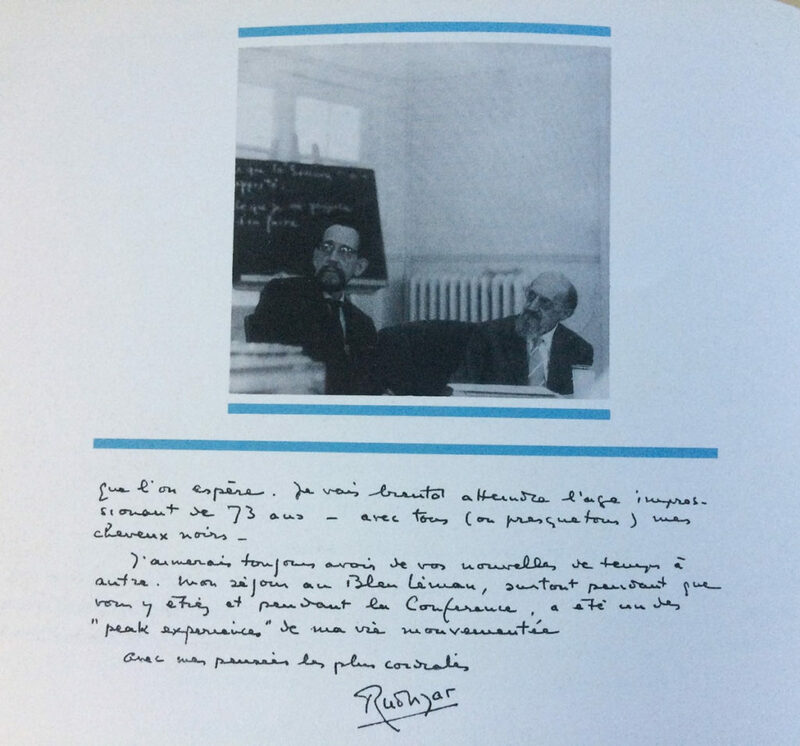 In this article, the world-famous astrologer, Dane Rudhyar gives a short astrological interpretation of the horoscope of Roberto Assagioli and offers also some of his thoughts on psychosynthesis. The classical psychology taught in European and American universities until a very short time ago was based primarily on philosophical assumptions and religious revelations. It took the unity of the individual person for granted and viewed it as a transcendental reality. It understood consciousness, reason, will, morality, and definite classes of emotions — “good” and “bad” — as set attributes of this individual person, in whom spirit and matter, reason and passion, God and the devil, were forever waging a struggle for the control of an immortal soul. The individual, being endowed with “free will,” could and had to choose which lead he was to follow. Left alone, he would be sure to gravitate toward matter and hell; but through the saving grace of God and His Son (or His Messengers, founders of religions and of all spiritual instrumentalities for regeneration), the individual could be “saved” and regain the divine heritage which somehow he had lost. We may call this the Platonic-Christian basis of psychology; and it is against the spirit of such a psychology that Freud fought, as a representative of the pragmatic, empirical, and scientific approach to nature and human experience. Being a physician whose task it was to cure people with sick minds and disintegrating personalities, he determined to ignore all the a priori, taken for granted ideas concerning man-the-individual, and to observe afresh what he saw. He found that the study of acute cases of mental disequilibrium, and particularly of strong neuroses, revealed processes of psychological adjustment and inhibition which were actually duplicated, in less definite forms, in supposedly sane persons. From this fact, he was led to investigate many traits of human behavior, experiences which did not fit into the clear-cut picture of individual man drawn by the Platonic-Christian psychology, or for which supernatural causes were claimed. His analytical probing went from dreams to mystical visions, from jokes to great artistic creations, from childhood attachments to the claims of Prophets. Ideals and idols toppled in his wake. Could their genesis not be explained on the basis of those psychological processes revealed by the insane? If a paranoic believes himself to be God, how different is this belief from that of the Prophets of old? If indisputably sick neurotics produce volumes of “automatic writing” ranging from chaotic statements to moral precepts, how are those different from the Koran, or “divinely inspired” books? If dreams can be explained convincingly in terms of physiological or psychological disturbances, why not also the “visions” of the Saints? Freud’s “nothing but” interpretations of the experiences and activities which brought to mankind the treasured products of its artistic and religious cultures failed, however, to convince a vast number of thinkers and psychologists. Without repudiating the facts uncovered by Freudian analysis, Carl Jung sought to establish new interpretations of these facts by associating them with other equally valid ones. Granted that certain mental activities of the insane seem to duplicate or parallel activities and experiences considered as profoundly spiritual in pre-Christian civilizations, the results of the two types are absolutely opposed. A madman, hears “voices” — and so does Joan of Arc. The former gets more insane, the latter saves and integrates a people and becomes the foundation of a nation. In other words, the observable process and psychological phenomenon may be the same in the two cases; yet, because the results are totally different (indeed, opposite) we must conclude that the causes of the abnormal conditions also are totally different. This leads to the problem which Jung tried to solve: How can we discover the value and meaning of psychological processes and experiences which are beyond the scope of the individual person and beyond the norm of a particular culture or society? How can we constructively interpret and deal with their first appearance in a person’s life so that this life (and the lives of others) may be enhanced and integrated, rather than deviated and pushed to some tragic ending? Jung consistently sought to remain at the level of observable facts of human psychology. He has refused to take anything for granted, especially any claim for the real, concrete existence at a “higher” level of transcendental entities, such as “spirits,” the Soul, or God — a claim made by most religions, and by “occultism,” modern or old. He interprets human experiences — even the most puzzling and seemingly transcendental — almost exclusively in terms of energies and processes. We face a world of energies, neither good nor bad, neither constructive nor destructive. It is our task to use them through the various processes of bio-personal development. If, however, for any reason a person is afraid of them, if he shrinks from making a positive, integrative use of them, or he opposes, thwarts, or deviates the processes of growth within his total bio-psychic organism — then, the energies turn destructive, and the integrative processes of human nature reverse their polarities and lead to disintegration. The reason for this negative attitude may be collective or individual, hereditary or environmental, seemingly accidental or linked with the destiny of larger groups. Whatever it be, it should be uncovered by the psychologist and removed as far as is possible; then, under guidance, the processes of human nature will be restored in their positive direction, and the person’s growth toward an ever greater state of integration will be resumed. Jung’s approach, like that of early Buddhism (in which man is left quite alone to face and overcome the eternal “Wheel of Change” and its illusory attractions) offers no supernatural agency for salvation; no Supreme Person to Whom one might pray, and no transcendent God­created Soul to pull spirit-ward its erring child, the “personality.” As a result, it has seemed vague and not comforting enough to many people. In studying Dr. Kunkel’s We-psychology, we have seen how this great psychologist with an eager, devotional-mystic feeling for God brought back to psychotherapy a sense of the reality — transcendent, yet “concrete” — of a Supreme Being, Who has an original purpose and plan for everyone and Whose “grace” sustains and draws the individual through and beyond his crises. Kunkel’s psychology is an attempt to integrate depth-psychology with the essence of an undogmatized and individualized Christian mysticism. On the other hand, the Italian psychologist Roberto Assagioli, founder of the technique of Psychosynthesis, sought to integrate depth-psychology with the modernized expression of the occult, Platonic-Hindu approach to man and God. The two efforts complement each other and are highly significant answers to the evident need of a confused and machine-haunted humanity. Roberto Assagioli was born at noon, February 27, 1888, in Venice, Italy. He took his medical degree in neurology and psychiatry at the University of Florence. He had broad philosophical and cultural interests and participated in various groups of young Italian liberals and thinkers, such as the one led by Giovanni Papini and Guiseppe Prezzolini, whose organ was the review, Leonardo. In Florence, he directed the Philosophical Library founded by Julia H. Scott, an American woman, and from 1912 to 1915, edited the scientific periodical, Psyche. As a result of his varied clinical and educational experience, he evolved the technique of personality-reconstruction which he called “Psychosynthesis.” In Rome, he founded his Instituto de Psicosintesi, which was presided over, until her death, by Countess Spalletti Raspoini, President of the National Council of Italian Women. He traveled and lectured widely in Europe and America. He died in 1974 after having published two important books, Psychosynthesis and The Act of Will, and having seen his ideas spreading widely in America and in Europe. After the beginning of World War II, his work in Rome became increasingly difficult because his humanitarian and international ideas and attitude aroused more and more suspicions and hostility from the Fascist government — until, in 1940, he was arrested and kept in solitary confinement for about one month. Dr. Assagioli told his friends that this prison episode was an interesting and valuable experience which gave him an opportunity for undertaking special psycho-spiritual exercises. Later on, he was able to lead a comparatively quiet life, secluded in the country. In 1943, however, he was again actively persecuted and had to hide himself in remote mountain hamlets. There he found companionship with an English parachutist and several fugitive prisoners and had two narrow escapes from the Nazi-Fascists who were after him personally and who sacked and destroyed his family’s country house near Florence. The arrival of the Allied troops liberated him in August, 1944. After the end of the War, he set himself to the task, which he had so long delayed, of putting in writing the entire scope of his concept of psychosynthesis. I had been staying with him in his lovely house in the hills above Florence in 1936 and seeing a good deal of him in Rome during that fall, and we renewed our correspondence after the War. At that time, he wrote me that he was working on an inclusive formulation of psychological ideas under the title From Man to Humanity. He said that he was particularly interested in a new definition of psychological types — more detailed than Jung’s — in the study of psychological disturbances attendant to the various phases of spiritual development, and in a study of group-relationships of all types. The following paragraphs, which he himself wrote, indicate at least the general trend of his particular approach. The diagnosis of the trouble which is affecting psychology at present clearly indicates the necessary cure, or the ways to inaugurate a new and more fruitful phase of its development. 1. The pooling of all available material which may be of value and usefulness without any exclusion of origin, time and place. 2. The starting point of the study of man should be his inner center of being, what he essentially is, and all other psychological facts, energies and outer manifestations should be studied in living relation to the center, which ever endeavors to co-ordinate and synthesize them into a living unity. 3. It should take into full consideration all the higher, the superconscious and the spiritual aspects of human nature which up to now psychology has mostly left to be dealt with by philosophy and religion, thus creating an unfortunate separation, and often conflict, in the ways of considering and handling human nature. 4. The principle of synthesis should be extensively applied to group psychology, developing from that standpoint to a definite branch of inter-individual psychology in which the various kinds of group-psyche, from the couple on to the family group, to the various communities, up to the psyche of humanity as a whole, would be studied. 5. The use of the synthetic principle in the practical applications of psychology, developing thus the art and the techniques of psychosynthesis, aiming at a complete and harmonious development of human personality, with special emphasis on its higher and spiritual aspects. What Dr. Assagioli means by “the higher, superconscious, and spiritual aspects” of man is made clear in an early article Psychoanalysis and Psychosynthesis published in 1934 in “The Hibbert Journal”; but before we come to this we should consider, at least briefly, the birth-chart of the psychologist himself — for the psychology is always an expression of the psychologist. Roberto Assagioli’s chart is very different in general structure from that of Kunkel, or of Freud and Adler. While it is somewhat more similar to Jung’s chart, it presents some very striking features; features which can indeed be seen to clearly symbolize his ideal of psychosynthesis. The basis of Assagioli’s chart is the configuration which I originally isolated and interpreted many years ago, calling it the “mystic rectangle.” The term “mystic” was not particularly fortunate, and at times I have substituted for it the qualification “sacred” or “integrative.” All these adjectives are attempts to characterize a configuration symbolizing a process of integrative synthesis of personality, to which is added an undertone of self-consecration to a super-individual purpose. In its simplest form, the rectangular configuration is one in which four planets are so related that they constitute two opposition aspects, two sextiles, and two trines. The oppositions form the diagonals of the rectangle, and in Assagioli’s case they are those between Venus-Saturn and Pluto-Jupiter. The shorter sides of the rectangle are represented by the sextiles of Saturn to Pluto and Jupiter to Venus; the longer sides, by the trines of Venus to Pluto and Saturn to Jupiter. Rectangles of such a shape can be considered as “altars” or “chambers of initiation,” in terms of archaic symbolism. They define a consecrated space within which a transcending process of integration and spiritualization takes place. They are to be differentiated from the “Mandalas” (or magical squares), which Jung associated with the process of personality integration, in that they link only two zodiacal elements (in this case, air and fire) while a perfect planetary cross (or geometrical square) links the four elements. The perfect square has thus more finality, is more self-contained; while the rectangle configuration of planets emphasizes the resolution of two conflicting natures into a dynamic effort toward a transcendent or sacrificial goal. In Assagioli’s chart, however, we see not only the above mentioned rectangle, but a far more complex pattern; there is also a Sun-Moon opposition (a full-Moon symbol of extreme awareness and illumination) which forms a perfect cross with the Pluto-Jupiter diagonal of the rectangle (and semi-sextiles with the Venus-Saturn diagonal). Moreover, Uranus is related to the Pluto-Jupiter diagonal through a sesquiquadrate and semi-square (aspects of stressful activity or response); while Mercury is also similarly related to the Venus-Saturn diagonal. As Neptune is only five degrees away from Pluto (and thus participates in Pluto’s aspects), and as Mars also squares the Venus-Saturn diagonal, there exists an extremely complex pattern of oppositions, squares, semi-squares, and sesquiadrates held together by sextiles and trines. 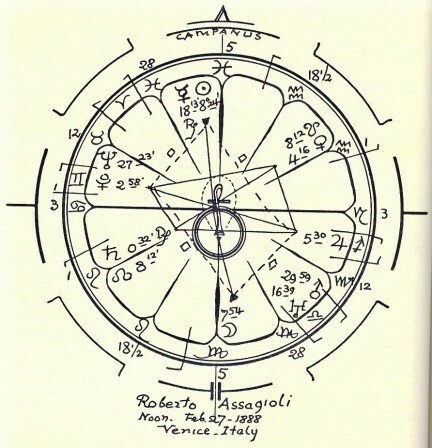 What this means is that, in Assagioli’s personality, a great variety of interests and foci of attention are represented, that his nature is widely open to the universe (Cancer rising, Sun and Mercury retrograde in Pisces) and contains many conflicting elements. These, however, are so disposed and interrelated as to make a very rich and complex type of personal integration possible. “Possible,” of course — not certain. A birth-chart is a pattern of potentialities; it does not provide any proof that these potentialities will become fully actualized. But the very pressure of this unusually varied and inclusive potential upon Assagioli’s consciousness, and the very challenge of a personality structure able to stand so many lines of stress and creative projection, is discernable in the ideal of psychosynthesis which he described. I should stress again that a person’s ideal creation is the exteriorization of the goal to which his total personality reaches out. His ideal is exteriorized as a doctrine; his strivings are generalized into a method; the blueprints of the perfected type, which is himself as a perfected person, are projected as a “vision,” or even “revelation” — even though the man himself is yet far from becoming in actual concreteness of living all these things which he teaches, visualizes, and strives toward. This applies to all of the psychologists whose charts we have studied so far. The chart reveals the character of the psychology, because the psychology is the projection of what the man potentially is, and what he seeks to become. He teaches himself — as he teaches others. The teaching is significant insofar as it is timely — that is, as it fills the needs of a group of individuals then living, or starting on their life-journey. Dr. Assagioli’s psychosynthesis is an answer to the chaos — but also the universalization of interests and strivings — which our generation has created. The multiplicity of energies and stresses, and the complexity of a global openness, are facts which must be met. Assagioli has had to meet them in his own person. And the solution has come out of the confrontation. How completely he has worked out the latter in his own life is beside the point here. The “pattern of solution” — the image of salvation, the principle of reconciliation of opposites — is obvious in his chart, and psychosynthesis is an interpretation of it. At the level of the personal life, it corresponds to global planning in the new society now in the making. elementary psychological activities which direct the life of the body instincts and lower passions, “complexes,” dreams and imagination of an inferior kind, manifestations of lower “psychism” and medium-ship, etc. ; 2) the middle unconscious, formed of psychological elements similar to those of our waking consciousness and easily accessible to it; 3) the higher unconscious, or superconscious; the region whence higher intuitions and inspirations come, the source of genius and mystical states; 4) the waking consciousness, the part of our personality of which we are directly aware; 5) the normal conscious self, the “I” which at once is the centre of our consciousness and contains, so to speak, the changing contents of consciousness” (sensations, thoughts, feelings, etc. ); 6) the spiritual self, “a permanent spiritual center, the true self . . . fixed, unchanging, unaffected by the flow of the ‘mind stream’ or by bodily conditions,” the personal conscious self being merely its reflection, its projection into the field of the personality. This concept of the existence of a personal or lower self (which is a mere “reflection”) and of a spiritual or “true” self (latent and unrealized by the conscious ego, in most cases) is typical of what we call the Platonic-Christian approach to psychology; it especially reflects the teachings of H. P. Blavatsky with which Dr. Assagioli was well acquainted. The entire structure of most religious beliefs — and also the claims of the “occultist,” medieval alchemist, and modern theosophist — rests upon this dualism, which is nevertheless an “illusion,” because there is, spiritually speaking, only one source of selfhood. Freud (and the type of psychology based on “scientific materialism,” empiricism, behaviorism, etc.) sought to prove that there was no validity in taking for granted the existence of such a transcendental and “true” self; that it could be very simply explained away. But Freudianism and psychological materialism do not offer a satisfactory or healing solution to the conflicts, insecurity, and generalized state of semi-neurosis of most people. In plumbing the subconscious depths and busying himself with “reducing” the complexes of the individual by mental surgery, did Freud not blind himself to the spiritual reality of the individual, the true self or spiritual soul? A complete knowledge of one’s personality. Control of its various elements. Realization of one’s true self, or at least the creation of a unifying center. Psychosynthesis: the formation or reconstruction of the personality around the new center. The utilization of our energies, of the forces released by the preceding process of analysis and disintegration of the subconscious complexes and attachments, and of the powers, aptitudes and tendencies latent, and up to now neglected which exist at the various inner levels (the application of psychodynamics). The development of the elements which are deficient or inadequate for the purpose we desire to attain. . . by means of direct evocation, auto-suggestion, creative affirmation, or by methodical training of the weak or undeveloped faculties; a training very similar to that used in physical culture or in developing technical skill, as in singing or playing an instrument. The coordination and subordination of the various psychological energies and faculties, in the creation of an inner hierarchy, a firm organization of the personality. This order and rule presents interesting and suggestive analogies with that of a modern state, with the various groupings of the citizens in towns, social classes, trades and professions, and the different categories of municipal, district, and state officials. The criticism which will be levelled at such a doctrine by many psychologists is that it is too rational, too well-ordered, too formalistic, or that its “spiritual realities” are taken for granted, not based on direct experience, but rather on religious authority or “esoteric” interpretations. The more mystical and less formalistic approaches of Jung and Kunkel stress more the factor of “process,” of flow. Psychosynthesis does not start the study of man with “his inner center of being, what he essentially is,” for conscious human experience does not begin with this inner center. In Dr. Assagioli’s system man is viewed as if from above, or outside of what he himself feels, knows, experiences. It can be said to be a theoretical or philosophical, more than a purely psychological view; a mental, rather than an experience-conditioned, approach. Structural clarity and a well-defined workable formula for psychosynthesis may be its fruits; yet there is danger in that a philosophical system tends to be superimposed upon the living substance of human search and human conflict — and sometimes substituted for the throbbing actuality of the experienced need of the moment. It is a danger inherent in all types of planning, and in all but the simplest kinds of classification. The most disputable point in Dr. Assagioli’s approach is that which deals with his attitude to the “spiritual self”; and because the central key to any psychology is the psychologist’s understanding of the nature of this self, I feel it is necessary to devote an entire chapter to this subject.